Table: A table of data. For each month the two data items supplied by the state are the actual value and the estimated value. This table also holds the computed variance, or difference, between the actual value and the estimated value. A positive number means the actual value was greater than the estimated value. Collections: Shows monthly collections for each component. Because monthly numbers vary widely, this data is presented as the moving sum of the previous 12 months. Annual Change: Shows the change from the same month of the previous year. A positive value means the value for the month is greater than the same month last year. Estimates: The Governor’s Consensus Revenue Estimating Working Group provides monthly estimates. This chart shows the variance, or difference, between the actual value and the estimated value. A positive number means the actual value was greater than the estimated value. 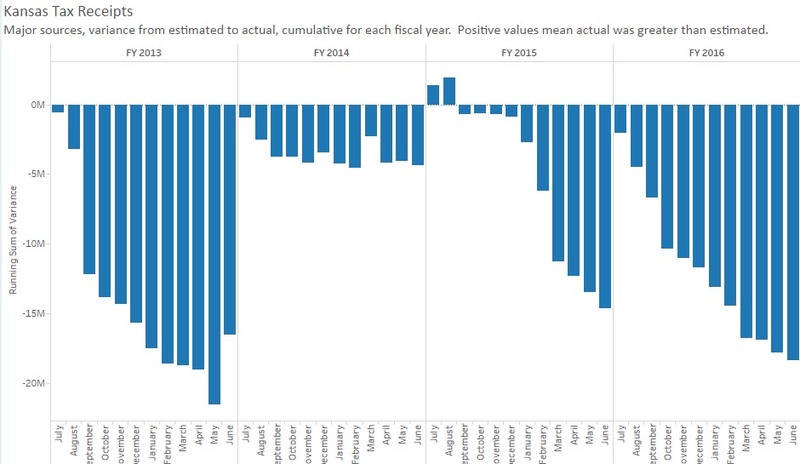 Running Total Estimates: This is the cumulative sum of the estimate variances, reset to zero at the start of each fiscal year (July 1). Running Total Change from Prior Year: This is the cumulative sum of the monthly changes from the prior year, reset to zero at the start of each fiscal year (July 1). Source of data is Kansas Division of the Budget.